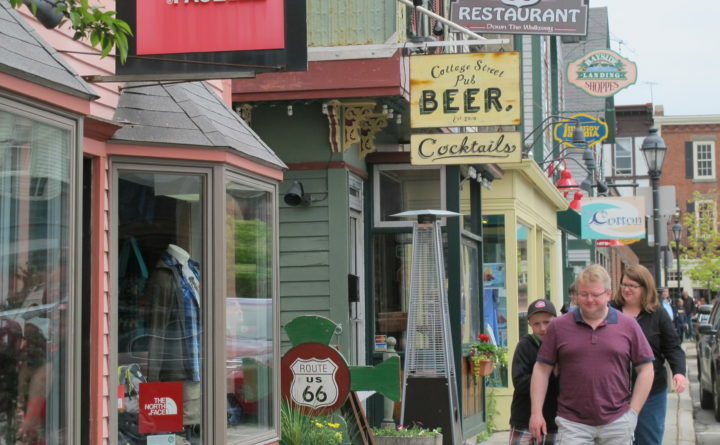 Pedestrians stroll by the line of shops and restaurants on Cottage Street in Bar Harbor in this file photo from June 9, 2013. In the last year, coastal cities in Maine have been trying to figure out how to address the increase of short-term rentals in their neighborhoods. Opponents of these types of mostly summer rentals say they inhibit the long-term housing market and disrupt neighborhoods. Cities like Rockland, Portland and South Portland have all recently taken steps to place some level of regulation and permitting on this class of non-owner occupied rentals. Belfast is mulling similar measures. But before the era of rental sites like Airbnb and Homeaway, Bar Harbor took steps to limit and regulate the presence of short-term vacation rentals in its seaside town. “I don’t remember it working it out very well. In fact, there were a couple of lawsuits and the town lost,” Bar Harbor Town Council Chairman Paul Pardis said. After years of discussing the short-term rental issue, in 2006 Bar Harbor voters approved placing restrictions on where in town short-term rentals could be located and implemented several layers of safety inspections and permitting. Around the time the ordinance went into effect, there were 300 to 350 short-term rental properties in Bar Harbor, according to a 2007 Bangor Daily News report. At the time, Bar Harbor was dealing with the same concerns surrounding short-term rentals that Maine communities are currently facing. Code Enforcement Officer Angie Chamberlain said the town worried that weekly vacation rentals were taking away from the availability of long-term housing. “I think the motivation is entirely just trying to loosen up some of that housing for year-round [residents],” Chamberlain said. The inspection and permitting ordinances that Bar Harbor enacted — along with the location restrictions — were an attempt to put short-term vacation rentals more in line with the safety rules in place for traditional lodging establishments. But the town faced backlash from rental property owners who claimed their property rights were being stepped on. They took their complaints to the board of appeals and the town was on the losing side. One of these legal challenges cost the town between $10,000 and $20,000, according to a Bangor Daily News report. Around 2009, Chamberlain said the town began rolling back these ordinances. There is no longer a restriction on where short-term rentals can be located and now property owners only have to complete a one-time registration with the town. But, in the wake of the town’s failed attempt to try and deal with the short-term rentals, the housing issues surrounding the rentals persist in Bar Harbor. “We have a housing problem. People buy up housing and can rent it short term for a lot more money than they would [get] for long-term [rentals],” Chamberlain said. Despite the recent wave of action taken by other towns, Bar Harbor is not currently working to regulate short-term rentals. Chamberlain said solving the housing issue in Bar Harbor is going to require more than just taking a look at short-term rentals. This is the approach the Rockland City Council is trying to take. Aside from the temporary cap on the number of non-owner occupied short-term rentals the city passed last week, a housing task force has been established to explore other ways the city can help increase in the availability of year-round housing. Having joined the Bar Harbor Town Council in time to see the backlash to the 2006 ordinance, Pardis’ suggests towns simply “be cautious” when dealing with anything involving property rights.